China expected to inform solid imports and exports growth in June. 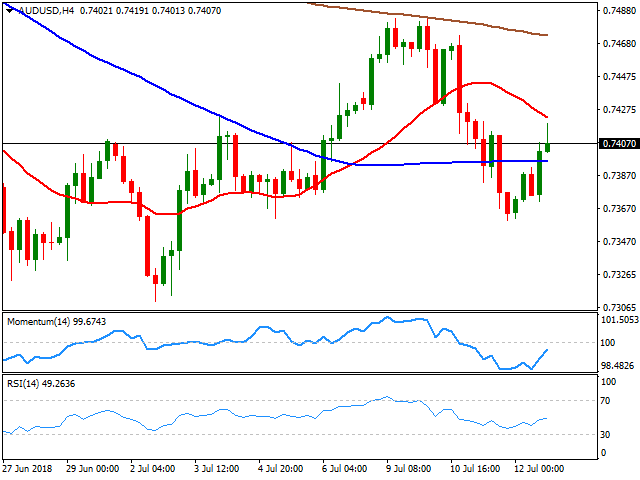 AUD/USD to recover further only on a steady advance above 0.7440/50 resistance area. The Aussie bounced alongside with equities and base metals, with the AUD/USD pair finishing the day a couple of pips above the 0.7400 figure. However, the advance in the pair has been quite shallow, similar to gold's one, as the commodity remains below $1,250.00 a troy ounce, a sign that bullish interest is still scarce. China will release multiple macroeconomic data during the upcoming Asian session, including money figures and the June Trade Balance. Imports and exports in dollar terms are expected to have decreased from the previous month, but sill print solid 20.8% and 10% increases respectively. Australia won't release any relevant data this Friday. Technically, the 4 hours chart shows that the price settled above a horizontal 100 SMA, but below a bearish 20 SMA, while technical indicators recovered some ground within negative levels, but with the RSI losing upward strength, currently flat at 48, limiting chances of a steeper recovery, at least as long as the pair remains below 0.7440/50, the immediate resistance area.